Thanks, Mike. A brand-new shot. There's a wealth of Spring Green and other Wright and Wrightian photos in that Flickr gallery . 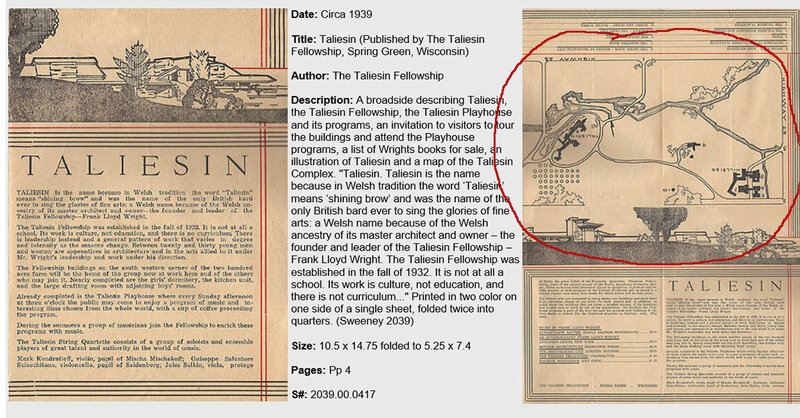 . .
On Steinerag.com I just ran across this 1939 Taliesin brochure thingy which has a Taliesin site plan showing the former grand entrance driveway thru the (sort of) abandoned stone gates and on across the ponds. It's pretty consistent with Besinger's drawing. One difference in the site drawing, they went ahead and optimistically included the unrealized design for the expansion of the Hillside complex (1939 was a watershed year for new projects so they were understandably optimistic about their future growth). 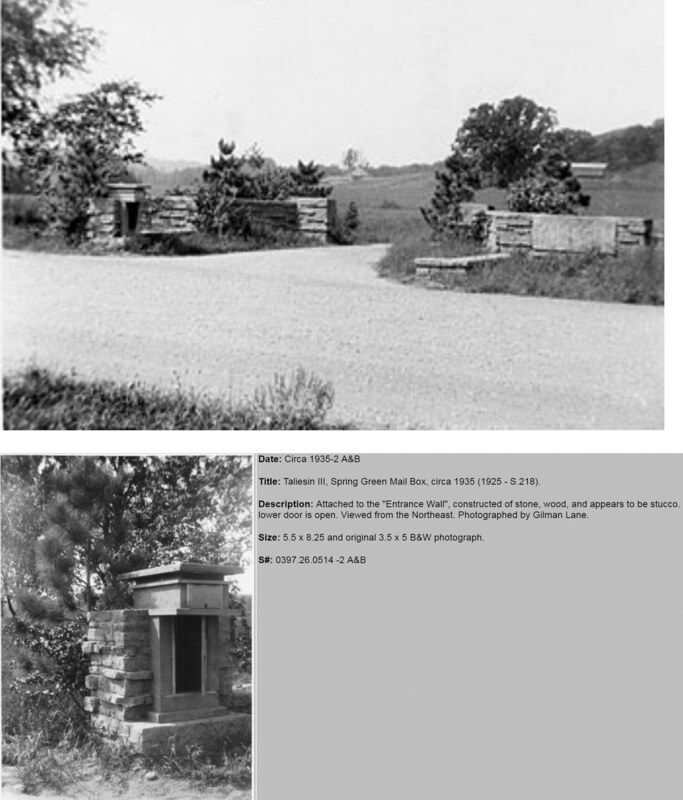 The connecting driveway between Hillside, Midway barn, and Taliesin to the east was not present. 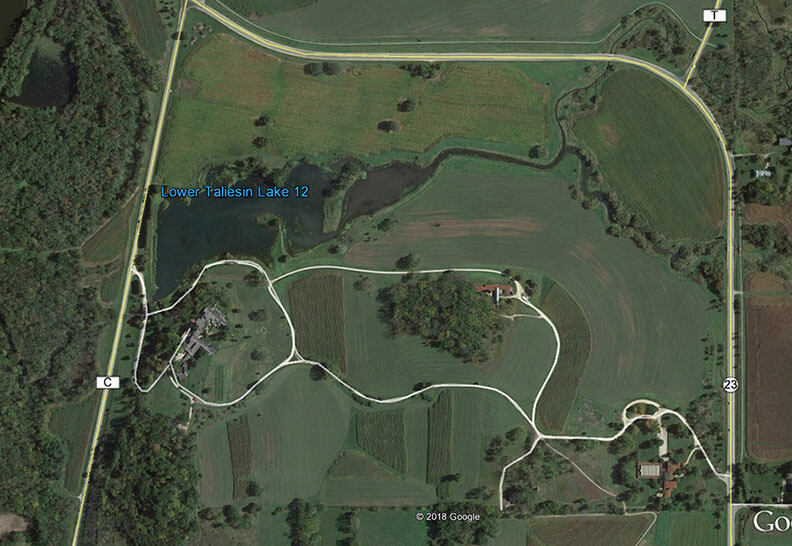 It looks like the lone access driveway leading to the Midway barn might've traveled over and thru the wooded hillside, slightly different from Besinger's routing (previous page of this thread). The drawings shows a small waterway just to the south of Hillside. Awhile back i thought we'd exhausted the topic of the 30's era entry gate, but I just ran across some extra tidbits in that wonderful source Steinerag. Here in Steinerag we see the original condition of the entry gate when it was built, as compared to its current state. Interestingly, we can see the ghost of the now gone part on the right where grass doesn't grow so well. Here's a close up of the original photo, plus one of the long gone mailbox. (it would be a bit of a hike to fetch that mail on any given day, particularly in the middle of winter). Letters/envelopes up top, with packages or drawing rolls in the lower compartment (with door ajar). The mail box should have a red flag to indicate to those looking out from the confines of the house on a day of inclement weather whether or not there was any mail for them to trudge out to retrieve. Your idea is a good one. Only a few trees near the gate would require pruning or removal, otherwise there seems to be a clear line of sight. For what it's worth, the Google Earth measuring thingy indicates that from the tip of the bird walk it is 1,806 ft. to the location of the mailbox (6 football fields, not counting the end zones). Red would undoubtedly be the ideal color for the mailbox flag (for multiple reasons), however its scale would need to greatly surpass that of the garden variety suburban mailbox. Perhaps, it should be somewhere between 10 and 20 ft. tall, which would be consistant with the flagpole we see in the Yahara Boathouse drawing. Rather than rotating that tall of a flagpole into position, perhaps the flagpole should be vertical & stationary and the mailman should just run up a square cherokee red banner whenever there was a delivery. Perhaps the flag could be stored in the little closet below the mail receptacle in between deliveries. That's as the crow flies. Now measure the walk through the snow-bound drive one would have to make to retrieve the mail. Binoculars would make even a small marker visible -- in good weather ? I love that mailbox structure. No reason not to apply one's preferred aesthetic to even the most pedestrian of functions ! 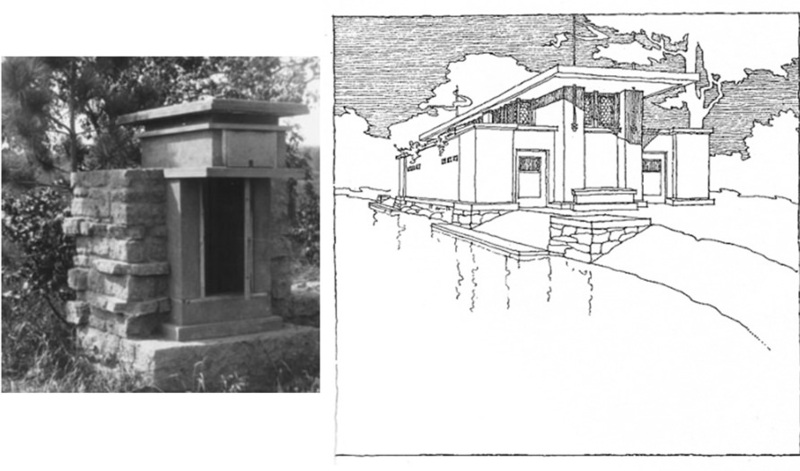 Lovness had a FLW-designed mailbox by the road. I don't see it there anymore on Google. Probably ended up at an auction house. The red mail box flag is used by the sender to indicate outgoing mail for the letter carrier to stop and pick up. I remember the Lovness mail box by the road, I think I have a photo if I can find it. I'll look. RG, you may be right about it ending up at auction. I think there was a steel gate from Lovness, removed when they widened the rather long driveway some years ago, being sold on Ebay. Nice. 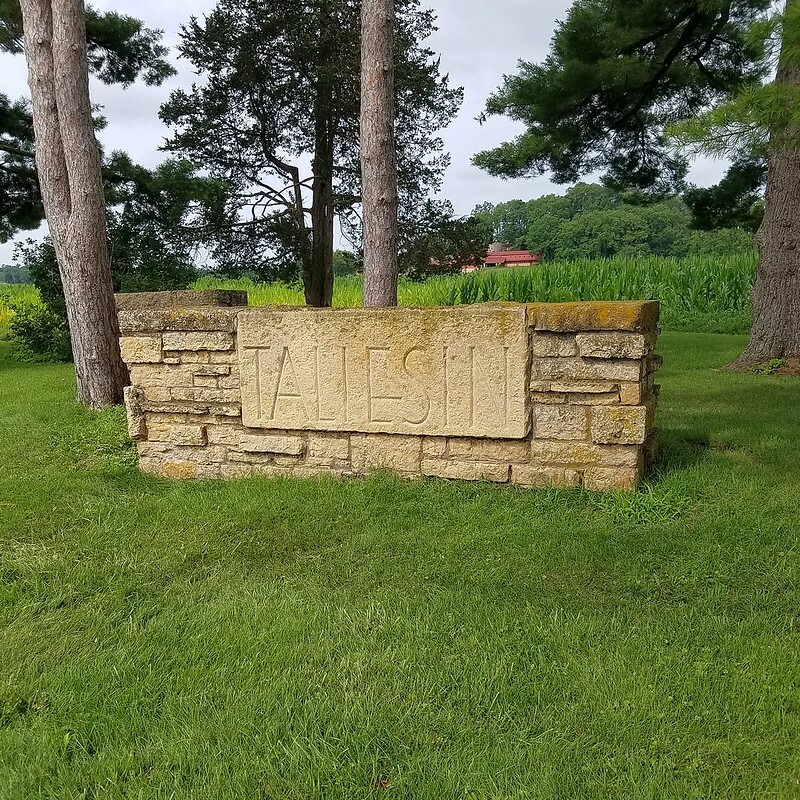 If the dates are right, this image suggests that, as things got livelier at Taliesin, it became necessary to add a sign identifying the owner of the mailbox and (not incidentally) the property ? The 2x2 stickwork at right was perhaps added at the same time. It would be great to see the whole arrangement . . . Thanks, Eric. Lots of other interesting things on that page !